Mark your calendars! 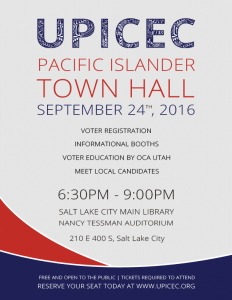 UPICEC will be hosting it's first ever Town Hall on September 24th at the Salt Lake City Public Library from 6:30-9pm. This event is focused on educating and mobilizing the Pacific Islander and Asian American community to vote. Stay tuned for more info. Tabling, sponsorship, volunteer opportunities, and all other inqueries: info@upicec.org Reserve your seat today!